Log cabin on the top of Ridge Road overlooking Holimont Ski Area. 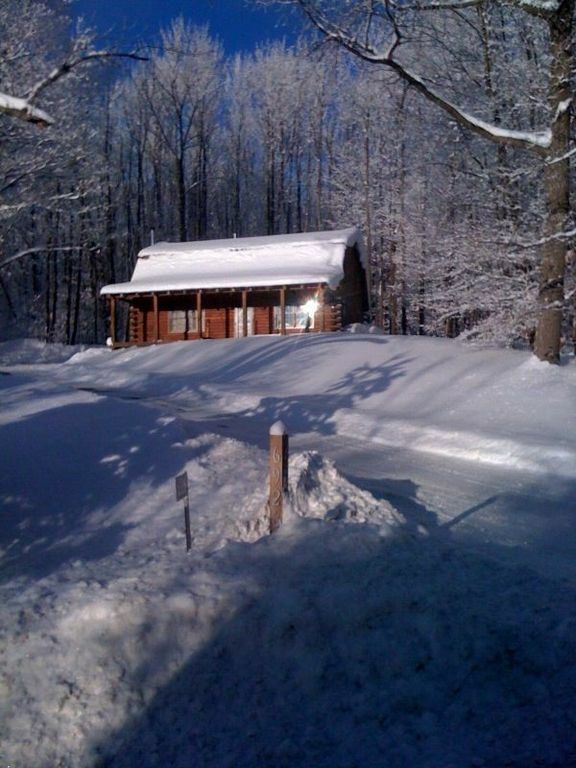 The property adjoins the Fingerlakes Trail for excellent hiking/mountain biking year round. Great for a quiet getaway, great for skiers, one and one-half miles from downtown nightlife! In addition to Holimont, Holiday Valley Ski Resort is just 3 minutes away. Complete with 3 bedrooms, 3 bathrooms, kitchen and laundry room. This is our second year staying here!! Both have been a great time! Its a very cozy cabin for freinds yo gather for a weekend! Sit inside by the fire or hang out in the hot tub or large front porch!! The property was nice and well maintained. Cosy place to stay, but not everything worked. Overall it was a nice stay. The property is really nice and well maintained. The area is great and it seems like a winter wonderland with all the snow we got. It is also close to the skiing slopes. Very cozy place. Only downside: We specifically rented this place because of the hot tub and that was not working for the whole stay. That is a bummer as there would have been other cheaper places and this was a main driver for our decision to stay here. Some kind of refund would have been nice. Thank you for the rental and I'm sorry for the hot tub going down while you were there but it is unfortunate that the unit wasn't able to be fixed during the weekend as we tried vigorously to have a tech to come and assess the issue. As it turned out to be main circuit board had failed and repaired the following few days after your departure under warranty. We do the best we can to assure the cabin and its features are at the optimum level of operations and cleanliness but at times situations like this are out of our control. Hopefully you will consider us for future rentals. Cozy cabin in the woods. Our family of 9 had a great stay in Ellicottville. Plenty of room (beds and bathrooms) for everyone with an easy drive into town or Holliday Valley and a slight view of Holimont slopes. The house provided everything you needed from the hot tub to a full kitchen for cooking, laundry, games, cable, WiFi, and movies. This is the a great cabin and the owners are excellent. My favorite part is that the cabin feel like you are roughing it when your not. The wood walls, wood burning stove, front porch and overall size of the place is great. We will be renting again. We rented this cabin in July for a weekend stay. The cabin stayed cool due to the log construction. Fans & screens are provided. The owner was so easy to work with and accommodating. He even went into town and took a picture of ice cream cakes to help me chose for a birthday surprise for one of our teenagers! All linens, kitchen utensils, and cookware were provided. 2 1/2 bathrooms was a real bonus! I highly recommend this rental! The property was fantastic! Great area and cabin. No complaints. All guests would go for a repeat visit!